Ready to kick your business up to the next level? The key is follow up. 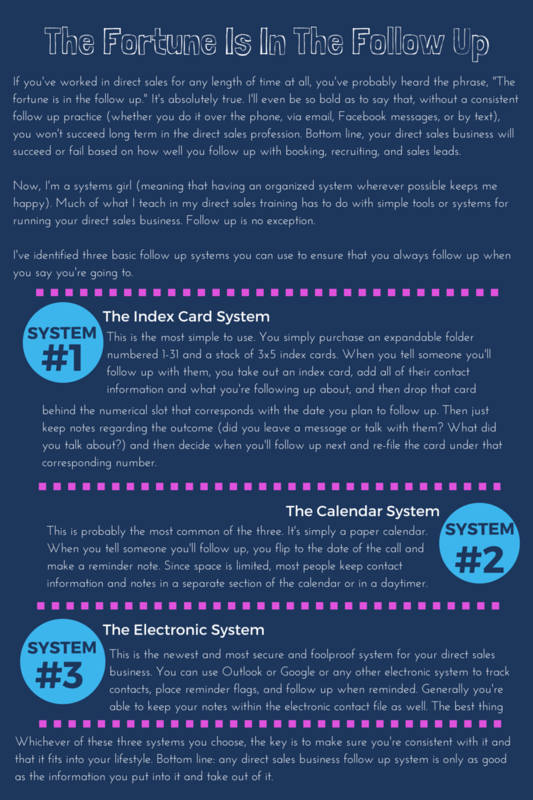 I’ve created a cool infographic for you that illustrates my three favorite follow up systems. You can learn more about these systems and how to use them in my “Get Organized & Take Back Your Life” program. Ready for a fresh start in your direct sales business this Spring? Grab your complimentary copy of my “Book Yourself Solid In The Next 30 Days” Roadmap. It’s yours for free when you subscribe to my mailing list. Already a member? My system won’t add you twice, so go ahead and grab the roadmap anyhow. Click here to subscribe to my mailing list.